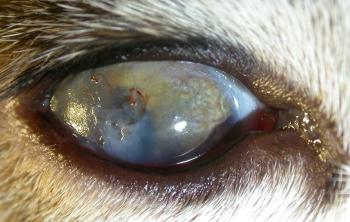 This six week old kitten showed signs of cat flu three weeks ago and now has this ocular appearance. What has happened and what would you do, if anything can be done, to reverse the changes? 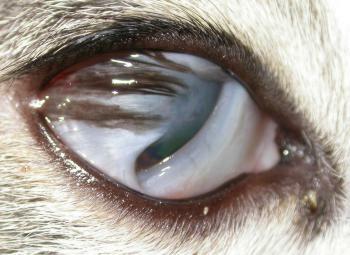 This is symblepharon where conjunctiva has adhered to the cornea after virally mediated necrosis of both tissues. Surgery is relatively straight forward to reveal and relatively healthy cornea underneath, as here, but the problem is keeping the surfaces from readhering. Massage of the eye several time a day with use of an antiviral like acyclovcir (see our recent paper Efficacy of topical aciclovir for the treatment of feline herpetic keratitis: results of a prospective clinical trial and data from in vitro investigations. Vet Record 2005 157(9):254-7 you can download from the recent publications page of the website although it should say 3% not 0.3%!) and steroid too maybe to reduce the aberrant healing but that’s a bit contraversial.